Latin music, they say, is conquering the world, colonizing its popular music charts and gaining unprecedented media exposure. Which would be welcome news were it not the for the fact that the music of the Ricky Martíns and their like represents the extravagant richnesses of Latin music about as effectively as Cliff Richard's Christmas single represents the glories of the western liturgical tradition. Even the explosive growth in Latin clubs and salsa dance classes, although at its best it has introduced the basics of the music to a new audience and provided a platform for local and international talent to perform live, at its worst means a routine of the same few CDs and the same few dance steps presented to an audience with a head throbbing with confused images of maracas, sombreros, tequila and ancient Cadillacs on the streets of Havana. In fact the term 'Latin music' is diffuse and often unhelpful, since it can cover anything from Mexican revolutionary ballads, Brazilian samba or forró, Andean music with its pipes and slack-toned drums, as well as the subject of this book. Sue Steward has sensibly chosen to regard salsa as a term that covers not only the core music, the brash and glossy commercial music that grew from Cuban son and developed in the barrios of New York and Puerto Rico, but also a host of other tropical dance musics. Dominican merengue, Colombian vallenato and its offshoots, as well as soukous and other African popular musics that stem from salsa all find a place here, some treated in more detail than others. In doing so she provides a welcome corrective to the ill-informed ideas and descriptions that have gained currency in many recent writings about salsa and its relatives. Beginning with a brief overview of the music and the instruments used in both traditional forms of the music and its commercial developments, the book is in the main organized historically. 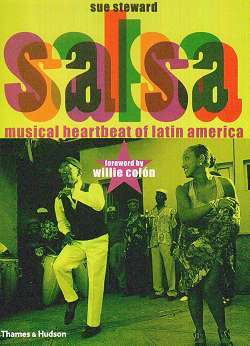 It starts with a description of the various Cuban musical styles that flowed together to create salsa, explaining the patterns of the deeply African rumba, the less rhythmically complex and more European melodies of campesina music, and most importantly the son, which is at the centre of what is today called salsa. By the time the twenties of the last century were reached, the three main strains of Cuban music had begun to emerge - the guitar- and tres-based sextetos, which added trumpet to the original son groups, the charanga, with its violins and flute, and the brass-led conjuntos which were the ancestors of the 1940s mambo bands. All of this is described with a good deal of detail and knowledge. One of the hardest things for anyone attempting to deal with the history of Latin music is disentangling the complicated trails that various musicians and personalities left behind them as they moved from band to band and even country to country, and in the ensuing chapters Sue Steward does this in an admirably clear way. She traces the manner in which patterns of emigration from Cuba to the United States laid the foundations of Latin music in that country, and gives full credit to the way in which Puerto Rican musicians, both on their own island and in New York, transformed the still rather provincial sound of Cuba into a pre-eminently big-city music, with complicated arrangements, a driving percussion section and the disciplined yet unpredictable way in which the sonero (the lead singer), bounced his, less frequently her, semi-improvised phrases off the unchanging coro of the backing singers in a call and response pattern that remains one of the strongest African elements in the music. The more recent growth of salsa and its development under the influence of pop and soul styles within the Cuban exile community in Miami is also given attention. Returning to Cuba, the chapter on the island's music following the revolution covers all the major figures, and is as up-to-date as is possible, given the rapidity with which the music continues to change and develop. She also pays attention to the attempts of the authorities to write out of history some of the most important musicians who fled the country or were trapped abroad - something that is now beginning to change. Both Colombia and the Dominican Republic are given chapters to themselves, the first as one of the powerhouses of salsa in its own right and as the home of the rather wonderful music of the Atlantic coast, vallenato and cumbia, the second as the place where the explosive merengue was invented and, as so often in Latin music, grew from a back-country music played by small groups into a highly-charged and technically brilliant big-band sound. And both Colombia's Carlos Valdes and Santo Domingo's Juan Luís Guerra, both of whom have made the greatest strides in turning their local musics into an internationally acclaimed pop music without compromising their roots, are the subject of their own sections. Along the way there are mini-biographies of most of the major figures in the music - not just the household names, such as Celia Cruz, Willie Colón or the musicians clustered around the Buena Vista Social Club project, but also a host of lesser-known singers and musicians, famous within the Latin community but less familiar to outsiders. This is one of the most valuable features of the book, and is a tremendous resource for anyone who wants to advance their acquaintance with the music but until now has had nowhere to turn. Although the chapter on salsa in Britain is a useful contribution to a field that is still woefully under-explored, the emphasis on certain musicians at the expense of others did make me raise my eybrows. Although the Colombian timbalero Roberto Plá is correctly given his due as one of the most influential figures, the names of other equally important musicians are missing entirely, while the attention given to some minor figures is surprising. Simply being present doesn't necessarily mean that they made any valuable contribution, musically or historically. There is generally a certain reluctance to make aesthetic judgements as opposed to historical ones: it is surprising to find Cuban trumpeter Arturo Sandoval lauded for his energy and technical skill without at least a mention of the woeful emotional aridity of his playing. The book ends with a brief glance at some of the latest names to arrive on the scene, and the current experiments in the United States and beyond in fusing Latin music with techno and computer-generated styles. The jury is still out on a lot of these, and it's impossible to guess which will survive and bear fruit; it's still useful to be given a sense of what they are. The wealth of illustrations helps bring alive some of the personalities mentioned, although unfortunately the captions appear to have been given less attention than the rest of the book, with many being confusing and others plain incorrect, but this is a minor flaw in what has to be counted a real success. It is possible to take issue (and musicians probably will) with some of the more technical descriptions of rhythmic and formal structure - the clave, described as a 'rhythm' in itself rather than a central convention which defines the points of coincidence of the polyrhythmic patterns shared out among the musicians, is one matter which I think is less than happily treated here - but this is a notoriously difficult problem. Nonetheless, this must the best and fullest available book on the subject in English, and will provide beginner and expert alike with a lot of information, a lot of food for thought, and a guide to what trails remain for them to follow in this wide and luxuriant musical landscape.